No matter which iPhone, or iOS software version you are using, the default Notes application will always take pride of place on the device’s SpringBoard. Well, that is until you hide it away in a folder or store it two homescreens deep to remove it from view. The point is that the Notes application has been part of the iPhone OS since the beginning and doesn’t show any signs of leaving Apple’s mobile operating system anytime soon. However, with that in mind, there are plenty of alternative options for users when it comes to jotting down those important small notes. Evernote from the App Store is a popular option as well as Microsoft’s OneNote, in fact there are probably hundreds of different notation applications which differ in functionality and features. They all however, have one thing in common, which is that as a user you have to undertake the cumbersome task of actually finding your application in your productivity folder and then tapping on it to launch, which we all know is a waste of a valuable five seconds of our lives which we could spend achieving excellence in other areas. The alternative, it seems, is to activate a note-taking widget in Notification Center which allows quick access to notes as soon as NC is invoked via the quick pull-down gesture from the status bar. The widget, called ‘NoteMe’ has been released by a developer known as j0egas and works in a similar fashion to the countless other Notification Center widgets we are seeing being released daily. There is no denying that being able to quickly jot down small pieces of information in Notification Center could prove to be a valuable tool, but unfortunately, NoteMe requires a little bit more work before it would be something I could use daily. The developer has obviously put some thought into polishing the widget, making it look very ‘Siri-esque’, featuring a torn-paper-style UI with a nice leather strip across the top. The fade along the bottom of the widget, mixed together with the text color choice does make this quite a nice looking widget to use, but the problems are evident when we start writing a note. Firstly, when tapping into the note taking area, the keyboard is produced as you would expect when any text field is being edited. Unfortunately, there is no logic provided in this widget to animate the view vertically, which means that the keyboard totally obscured the note-taking area in my tests, rendering it totally unusable. There is also a lack of basic Action Menu features such as the ability to cut, copy and paste, which is the bare minimum you would expect from something which is designed purely to accept text input. To combat the keyboard obscuring the view issue, you can edit the notification hierarchy and place NoteMe at the top of the Notification Center tree, but that is not an elegant solution and only serves to force the user’s hand providing a bad user experience and more than likely an immediate uninstall. NoteMe is a nice idea, but this initial implementation requires additional thought before it could be something I could imagine using regularly, but it is free of charge, so worth a try for users looking for this kind of functionality from NC. iOS 5 is required to install NoteMe, with the widget being available as a free of charge download from the BigBoss repository. You will obviously need to jailbreak your device to install this tweak. For jailbreaking iPhone4S and iPad 2, you can simply follow our step by step guide posted here to jailbreak iOS 5.0.1 using Absinthe on Windows or Mac. 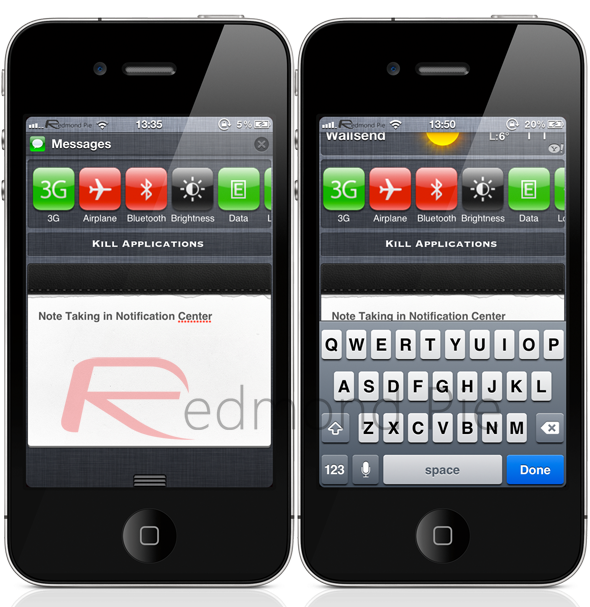 For those of you with iPhone 4, 3GS, iPad 1, and iPod touches can use Redsn0w or Sn0wbreeze to untether jailbreak on iOS 5.0.1.